Every Sunday morning Patty dressed in her prettiest clothes and went to visit her grandmother. She'd fix Patty tiny cakes and pastries and they'd eat finger sandwiches filled with egg and chicken and cucumbers. Each time Patty visited her grandmother, she gave Patty a new book. “Read as many books as you can, Patty. You'll grow up to be a smart girl.” Patty would rake the books home and read them over and over and over again. Patty loved to read poems about daffodils and sunflowers and babies with their mamas. Her favorite book was Robert Louis Stevenson's, A Child's Garden of Verses. Patty and her grandmother would sit under a tree and take turns reading poems and nibble on watercress sandwiches. They'd dip stalks of rhubarb into sugar and sip lemonade. Patty finished getting dressed. She put on her yellow bloomers, her pink socks and black shoes, and her prettiest pink dress with gold buttons. 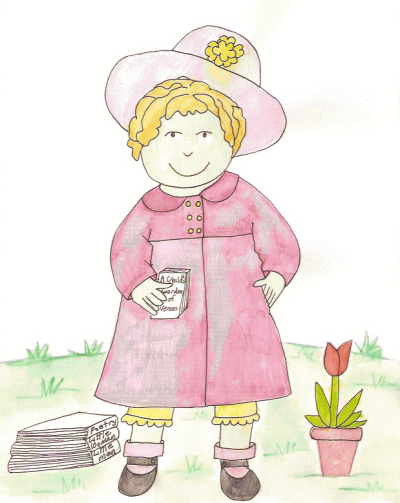 She grabbed her pink hat with yellow flowers and carefully arranged it on her hair. Before she left the room she grabbed her favorite books. Patty took the ceramic flower pot from her mother. A red tulip grew tall and strong. “Thank you, Mama. I know she'll love it.” She took the flower to her grandmother's house. “I love it, Patty! Thank you for the pretty red tulip.” Grandmother hugged her and gave her a kiss on the cheek. All day they read stories and sipped ginger ale and then had a tea party with Grandmother's dolls. Every time Patty looked, she saw her grandmother gazing and the tulip and that made her feel good inside.